Syndicate Bank is one of the oldest and major commercial banks of India. It was founded by T M A Pai, Upendra Pai and Vaman Kudva. At the time of its establishment, the bank was known as Canara Industrial and Banking Syndicate Limited. Applicants who have completed Degree / MBA or equivalent from a recognized Institute for Syndicate Bank Recruitment 2019. 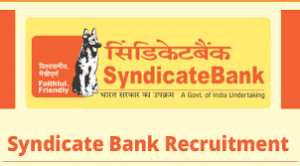 Eligible & Interested candidates can download the Notification & Application form on the Official website page at www.syndicatebank.in Syndicate Bank Recruitment 2018.